With essays by Lars Nittve, Chang Tsong Zung, Catherine Maudsley and Connie Lam. 辛 尼娅 候丝娜将中国的人物与意象融汇于她独具风格的绘画里， 似乎窥见了这个百年旧梦的当代形貌。她的画风，脱化白渗透着欧洲战乱年代之苦闷的强烈的表现主义艺术，从而树立起一种擬旧的趣味，将画中人变成了历史的产 物。她作品里的中国人与欧洲人，从西方主导的艺术史语境说来，是以极其对立的方式呈现的；令画中人的现实显得不加修饰、生硬粗糙的浓重色块，暴露了的主角 们身处的过渡性生存状态。其生活看上去随波逐流，混乱无序. Xenia Hausner’s creative process is all-embracing and painstaking. It looks left and right; up and down, and it is not surprising that this global vision includes both Eastern and Western subjects and imagery. But it is the fundamental human condition which most concerns the artist. Of her paintings’ themes – loneliness, uneasiness, catastrophe and love – she says, “It is not my goal to present clear solutions, but to be precise in fragments whose mystery I am unable to solve.” Conveying ambiguity and tension are the hallmarks of her work. (…) As a traveler, the artist delves beyond the surface of whichever place she is visiting. She creates her tableaux, all of which are invented, not actual scenes, guided by a fertile imagination and painterly technique, and with a flair for composition. She doesn’t paint “en plein air”, but reconstructs scenes in her studio where she and a workshop team make extraordinary and exacting efforts. “Marking out the stage” is a familiar process for Hausner, who designed sets for nearly two decades. Her eye for colour, shape and form guide her to objects, including everyday ones, that have the qualities she seeks as an artist and appeal to her deep cultural curiosity. A group of objects in “Crew Cabin” (2014) resonate with those in Zhang Xiaogang’s “Bloodlines” paintings: the red cord, here an electrical cord with an on-off switch, and a group of old black and white photographs. But this is where any resemblance ends. The female figure lying on the bed peers purposely and directly, challenging the viewer to alleviate the essential aloneness. Although placed in a grouping, the black and white photographs are of individual figures, highlighting each person’s solitariness. The carpet’s pattern is Chinese, and the patterning on the tabletop could suggest rattan. The green telephone, whose colour contrasts so strongly with the red bed cover and other red accents, is startling. Once belonging to a ship’s cabin, the telephone was found in a Hong Kong bric-a-brac shop. Theoretically, it allows communication with the bridge and other areas of the ship, but as an outdated, obsolete object, it dramatically emphasizes the aloneness of the cabin and its occupant. In “Saint Francis” (2013), two uniformed school girls sit in front of a massive “Coca-Cola” sign. Chinese artists Ai Weiwei and Wang Guangyi have responded powerfully to the omnipresence of this global soft-drink brand: Ai transforming ancient Chinese vases by painting the Coca-Cola logo on them and Wang by using it in his famous political pop painting “Great Criticism: Coca-Cola”. Like Ai and Wang, Hausner uses the logo to make a trenchant cultural and artistic statement. 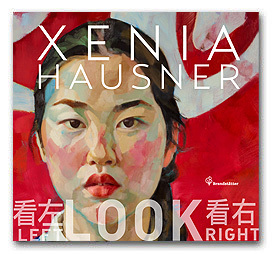 Zhang Xiaogang and Liu Xiaodong, two leading contemporary Chinese painters, are figurative painters in the way that Xenia Hausner is one. Zhang’s well-known “Bloodlines” series exposes fractured human relationships. Liu’s paintings such as his five-panel “Hotbed” (2005) depict disrupted lives. Zhang Xiaogang’s work entered the world stage in 1994 with the São Paulo Biennial and came to even greater global attention in 1998 with the ground-breaking group exhibition Inside Out: New Chinese Art. Zhang’s “Bloodline: Family Portrait No. 2” from the mid-1990s startled viewers with its impersonal trio of an expressionless mother, whose face is rendered in flesh tone colours, and expressionless father, rendered in tones of grey derived from the studio photograph on which the painting is based. Their yellow-hued son is positioned between them. The three figures are linked by a red thread. The artist’s use of fine brushstrokes emphasizes the stillness of the scene. Liu’s engagement with social predicaments in his homeland can be seen in his paintings that focus on the human cost of building of the Yangzi River Dam. His engagement with issues beyond mainland China are evident in his multi-panel work, “Battlefield Realism: The Eighteen Arhats” (2004), which juxtaposes nine portraits of mainland soldiers and nine Taiwanese ones, communicating the universality of humanity, not political differences. In 2008, he depicted illegally dumped trash in Naples, Italy; in 2010 he turned to the theme of teen violence in America and in 2013 he painted for a month in the defunct Austrian mining town of Eisenerz.